If joy were a person, he’d bring both peace and frenzy. He’d be full of music, light and energy that soothes even as it stirs us up. 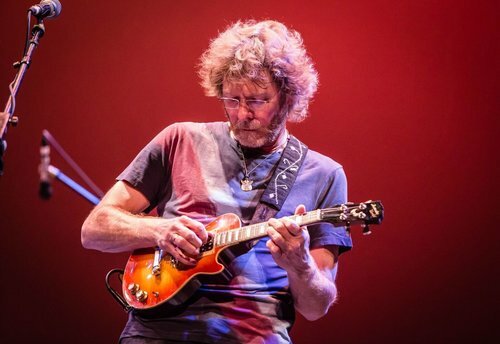 Eyes closed, wire-rim glasses in place, mandolin pressed against his ribs, joy would be Sam Bush on a stage. The Father of Newgrass and King of Telluride has long since established himself as roots royalty, revered for both his solo and sideman work, which includes time with Emmylou Harris, Lyle Lovett and Béla Fleck. But instead of kicking back and soaking up honors such as an Americana Music Association Lifetime Achievement Award and a suite of Grammys and International Bluegrass Music Association trophies, Bush still strives relentlessly to create something new. The McCoury brothers––Ronnie (mandolin) and Rob (banjo)––were born into the bluegrass tradition. Talk about a source abundant and pure: their father, Del, is among the most influential and successful musicians in the history of the genre. Years on the road with Dad in the Del McCoury Band honed their knife-edge chops and encouraged the duo to imagine how traditional bluegrass could cut innovative pathways into 21st century music. Together, the Sam Bush Band and the Travelin’ McCourys will take the stage at GPAC on Thursday, April 18 at 7:30 PM. For tickets and information, visit GPACweb.com or call the Box Office at (901)751-7500.